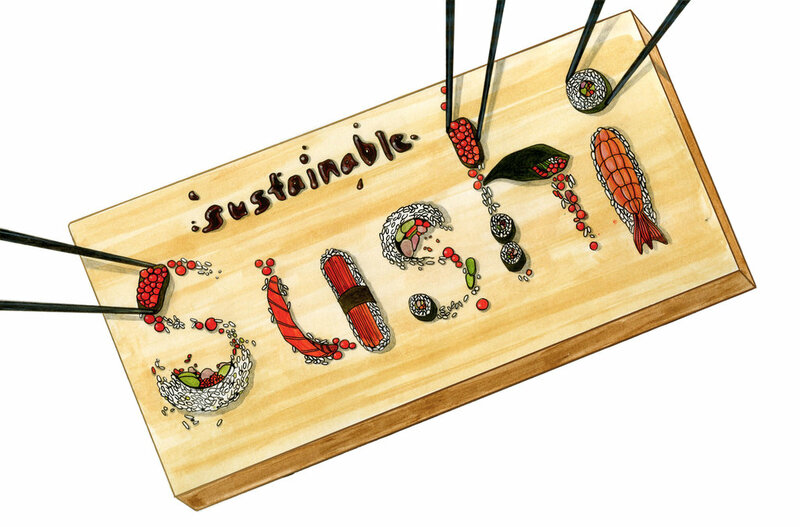 Helps you choose fish that are sustainable and multiply quickly. Seafood Watch is a good place to start. With Seafood Watch App you can get information on a specific fish or find suggestions for alternatives that would have a similar taste and texture. 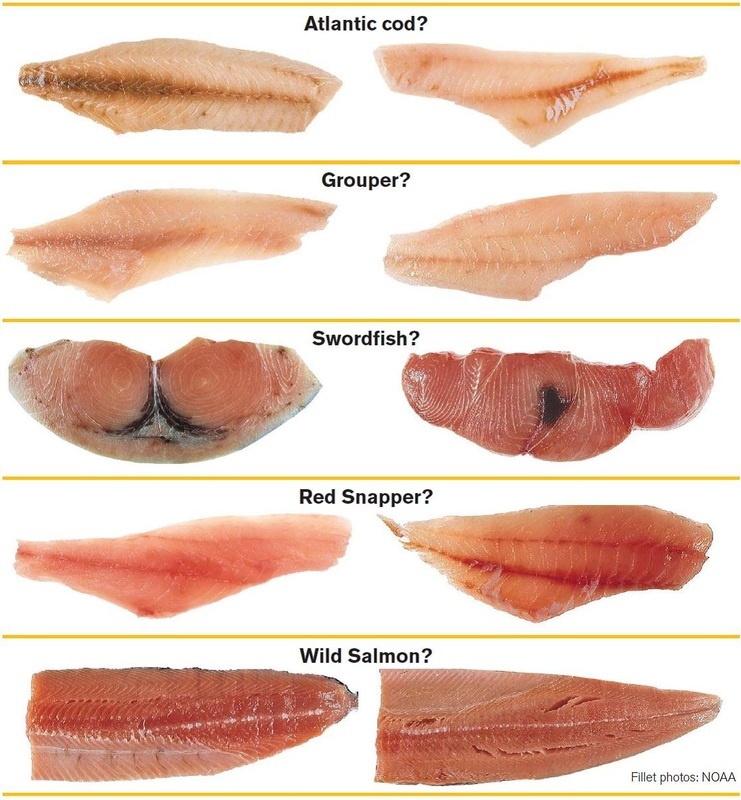 Can you identify wild salmon versus farmed salmon? 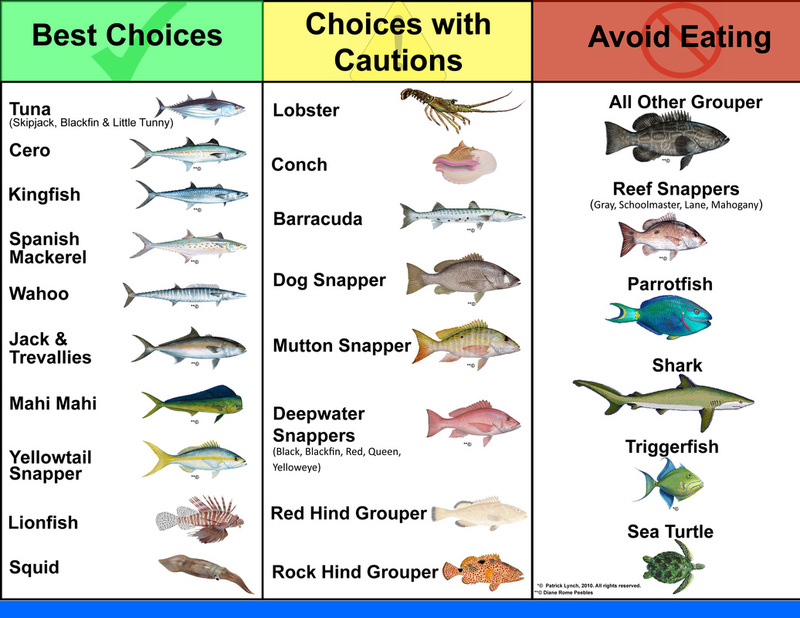 Get to know your fish choices. How we shop for seafood can impact our future supplies! When you purchase seafood from stores that are putting sustainability and honesty first, you invest in the future of our seafood supply. 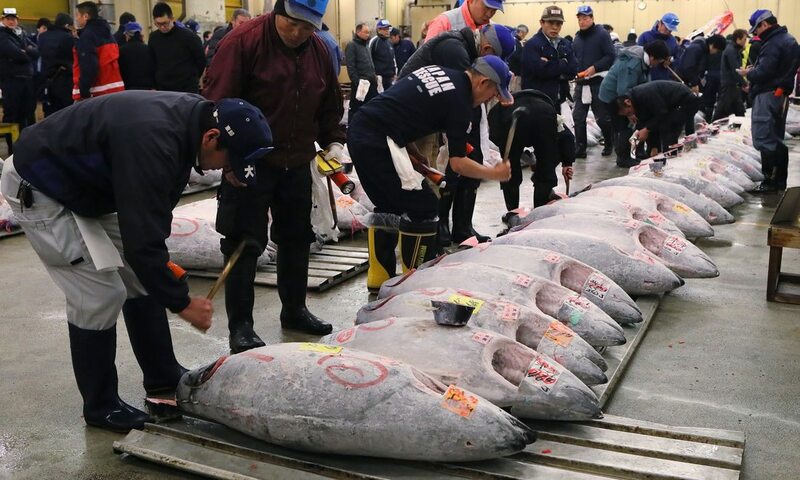 When companies loose sales because customers refuse to support their bad seafood buying practices, they will be forced to change and start to try harder to support sustainable fishing. Sales are everything, and without them no business. NOT ALL BUSINESSES ARE OPERATED THE SAME. SOME MAKE BETTER CHOICES. Use this simple guide to help you make better seafood purchases. Collectively we can heal our oceans. The overfishing is pushing many species to the brink of extinction. With little funding together with the vastness of the oceans, it is impossible to police all ships all the time, but consumers can stop the bad guys at the point of purchase by saying, "No I will not buy that product." Fishing boats that take way more fish than allowed by law are also doing other things that hurt the oceans and everything in them by using illegal net, or other fishing techniques like dragging along the bottom floor that destroys all types of life. The oceans are not a free for all to make certain people money rich and the worlds population food poor. Correct answers are : 1. 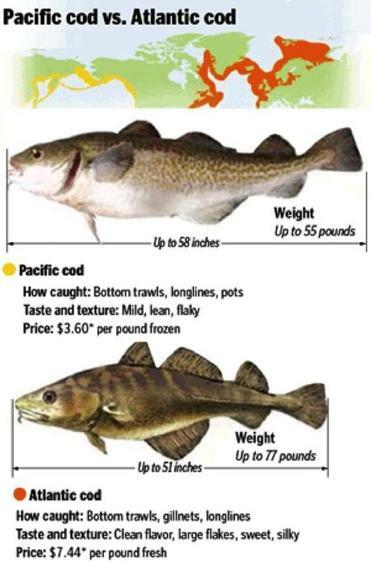 Right is cod (left=escolar). 2. Right is grouper (Left= perch). 3. Left is swordfish (Right= mako shark). 4. Left is red snapper (right= rockfish). 5. Right is Wild Atlantic salmon (left= farmed). CAN YOU IDENTIFY THE REAL THING? Click here to find out how Dr. Alex Morton found virus infected farmed salmon on store shelves in BC, Canada. Infection could be spreading down the coast. 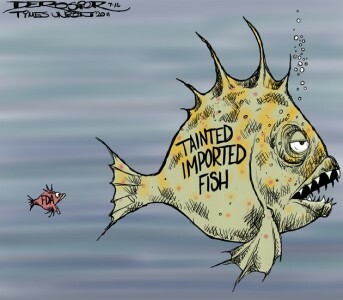 It is farmed salmon practices that breed the virus. There is ways to grow salmon inland without exposing wild salmon to the virus, bacteria, and parasites found in pens where they are grown in ways that do not replicate the true life cycle where sick salmon are killed off. That fish you ordered may not be what you were told on the menu. 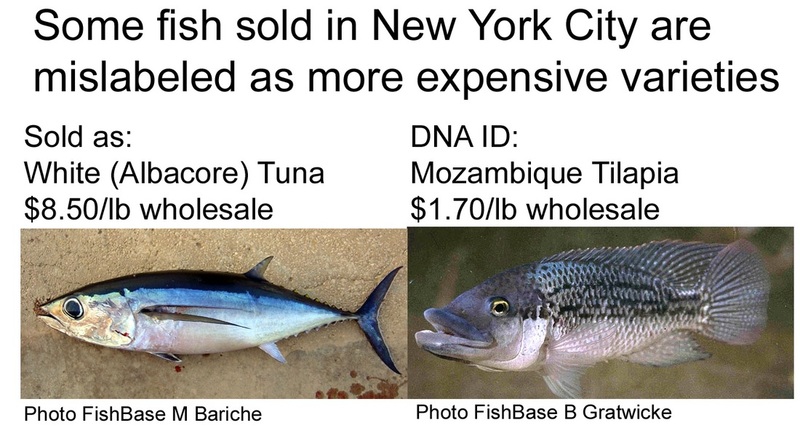 Oceana found "Seafood Fraud" to be as high as 74%. Cheaper fish is substituted for more expense fish advertised on the menu without your knowledge and for a large profit margin. Availability can also be a problem with overfishing. 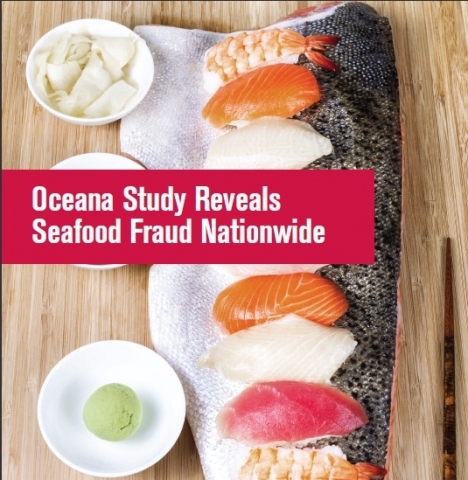 Read the full Oceana Seafood Fraud Report. Is that sushi really what you think? 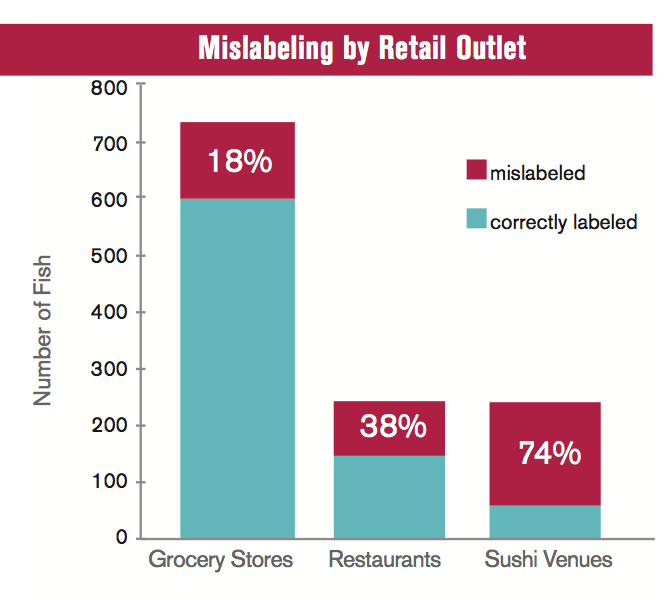 Oceana group found 74% of sushi is mislabeled. Fish served is a lower cost fish and NOT what is on the menu. Ask about authenticity fish and then decide if you llllm or just accept! More here. Click to go to the full SeattlePI slideshow. 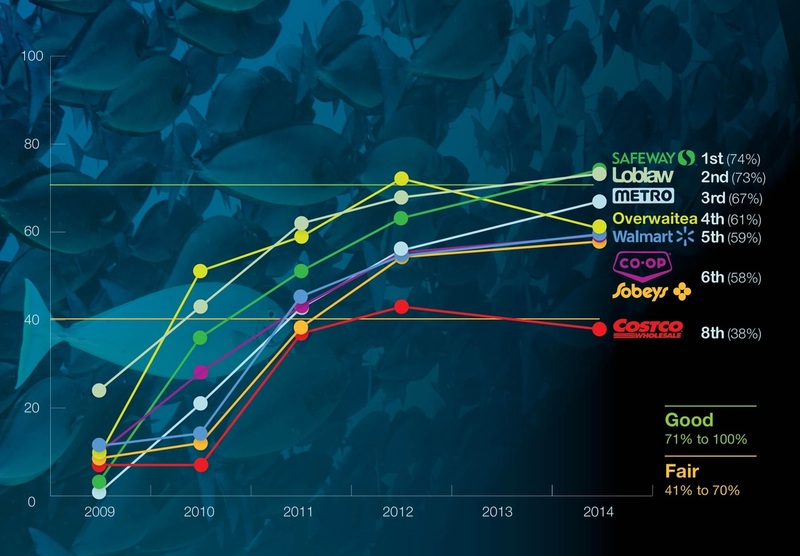 These are the results that Oceana got from fish samples tested. 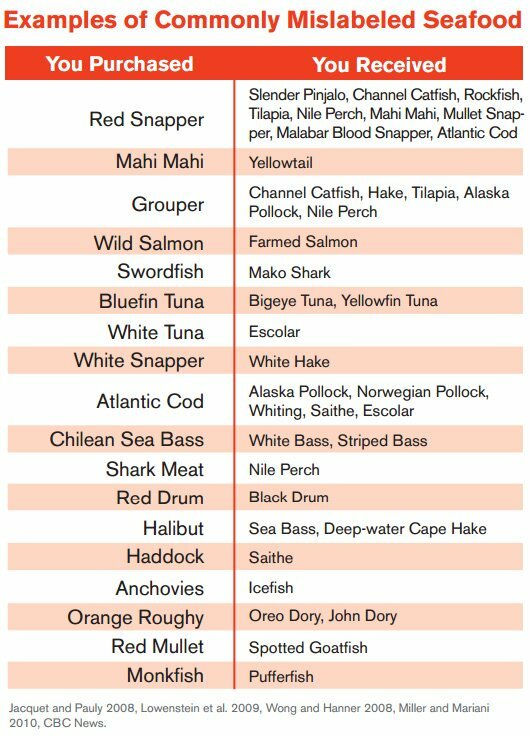 ​Here are the types of fish that are used as lower cost substitutes for what is claimed to be used on the menu. When you look at the difference in cost it is easy to see the motivation as a much higher profit margin. CLICK GRAPH FOR LARGER IMAGE TO READ EASIER. Click to visit the artist. How does mercury get into fish?Most of the mercury that contaminates fish comes from household and industrial waste that is incinerated or released during the burning of coal and other fossil fuels. Products containing mercury that are improperly thrown in the garbage or washed down drains end up in landfills, incinerators, or sewage treatment facilities. The mercury then leaches into the ground and water. Once mercury enters the water and soil, it is naturally converted to methylymercury by bacteria. In water, the bacteria are eaten by plankton and other small creatures, which in turn are eaten by small fish, then larger fish. Mercury doesn't easily leave the body of an organism, so the amount of mercury builds up in species as they go up the food chain in a process called bioaccumulation (PDF). Larger, older fish accumulate more contaminants than smaller, younger fish. How do other contaminants get into fish?Toxic contaminants end up in our state's waterbodies in different ways. Industrial and municipal discharges, agricultural practices, and storm water runoff can all put harmful substances into the water. Rain can also wash chemicals from the land or air into streams, rivers, lakes, and Puget Sound. Fish absorb contaminants such as PCBs, PBDEs, dioxins, and chlorinated pesticides from water, sediments, and the food they eat. In contaminated areas, bottom-dwelling fish are especially likely to have high levels of these chemicals because these substances settle to the bottom where the fish feed. What are the health risks of eating contaminated fish?Contaminants can build up in your body over time and may result in health problems. It can take 5 years or more for women in their childbearing years to rid their bodies of PCBs, and 6-12 months to significantly reduce their mercury levels. Mercury, PCBs, and other contaminants can be passed on to a developing fetus through the placenta. Mercury related health problems are most severe for the developing fetus and young child. Babies born to mothers who have a lot of mercury in their bodies may develop more slowly and have problems learning. It is believed that infants and children are more susceptible to the effects of mercury because their nervous systems continue developing until adolescence. In adults, mercury can lead to problems of the central nervous system and possible adverse effects on the cardiovascular system. PCBs are linked to infant development problems in children whose mothers were exposed to PCBs before becoming pregnant. PCBs can cause changes in human blood, liver, and immune functions of adults. How do I reduce my exposure to contaminants in fish? Eat a variety of fish that are low in contaminants. Follow our healthy fish guide when choosing seafood at the store or restaurant. Follow statewide mercury advisories for certain store-bought and sport-caught fish - this is especially important for women who are or might become pregnant, nursing mothers, and young children. Check local fish consumption advisories before you go fishing in Washington waters. Avoid eating the skin and fat on fish. See our tips on preparing and cooking fish. Should my children and I eat fish?Yes fish is nutritious and beneficial to your health Fish is low in saturated fat and a good source of protein, vitamins, minerals, and omega-3 fatty acids, which are great for your heart, brain, and overall health. Eat a variety of fish that are low in mercury and other contaminants and follow the steps for reducing your exposure to contaminants in fish to assure you gain the health benefits from fish. Unfortunately, contaminants are in most foods, so avoiding fish and replacing it with other protein sources like meat or poultry will not eliminate your exposure to contaminants. Should I eat fish when I'm pregnant or breastfeeding?Yes, during your pregnancy is a very important time to eat fish. Remember to avoid eating fish high in mercury and follow the steps for reducing your exposure to contaminants in fish. Breastfeeding provides your baby with health benefits that will last a lifetime. The benefits of breastfeeding outweigh any risks that your baby may receive through breast milk. The key is to continue choosing fish low in mercury and other contaminants so you and your child gain the benefits of fish. The health benefits of fish are important for you, and your child's development. See our fish advice for women and children. Can I cook fish a certain way to reduce contaminants?It depends on the type of contaminant. Contaminants such as PCBs and DDT concentrate in the fat of fish. These contaminants can be reduced by up to 50% by preparing and cooking fish properly. Cut off the skin and fat before cooking fish. Then broil, grill, or bake it on a rack so the fat drips off the fish. Don't use the drippings for sauces. Fish contaminated with mercury can't be prepared or cooked in a way that reduces the mercury. Mercury is stored in the muscle tissue (the meat of the fish). What about canned tuna?Choose "light tuna" over "white tuna." Our study revealed that mercury levels in canned light tuna were three times lower than those in canned white (albacore) tuna. Albacore tuna is also called white tuna. There does not appear to be much difference in mercury levels between solid and chunk tuna, or between tuna packed in water versus oil. Our canned tuna advice is part of the statewide fish consumption advisory for mercury, which should be followed by women who are or might become pregnant, nursing mothers, and young children. Is salmon safe to eat?Yes, most species of salmon have very low levels of mercury and other contaminants and are safe to eat. See our healthy fish guide for smart salmon choices. What can I do to keep contaminants from getting into fish?To keep contaminants from getting into fish you have to reduce toxic chemicals getting into the environment. See the Department of Ecology's tips on reducing toxic threats. 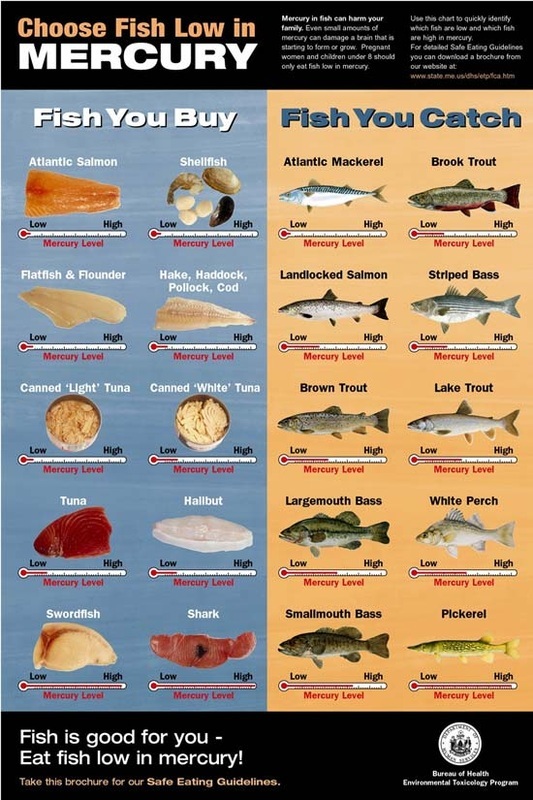 What is the state doing to reduce contaminants in fish?Washington State's goal is to reduce and phase-out persistent, bioaccumulative, and toxic chemicals such as mercury, PCBs, DDT, and dioxins which threaten human health and the health of the environment. Learn more about Ecology's initiative to reduce persistent, bioaccumulative toxics. Clean water is essential to have healthy fish. We work closely with the Department of Ecology to assess contaminants in fish. Ecology identifies and monitors toxic chemicals found in aquatic environments and identifies actions that can be taken to reduce these chemicals. See Ecology's reducing toxic substances in our environment to find out what Washington State is doing.